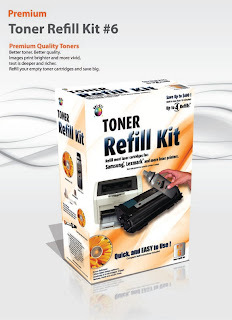 These three toner refill kits for the Samsung CLP325, Samsung CLP620 and Samsung CLP770 are the latest in the market for color Samsung toner. The CLP325 is the upgraded replacement for the Samsung CLP315, which has been a best selling color toner laser. There are industry reports that Dell has dropped the profitability it offers its Dealers for reselling OEM Dell toner cartridges. The profit margins are reportedly as low as 5% now. Where is the incentive for a dealer to resell OEM Dell toner cartridges? 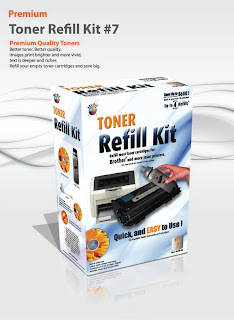 The 3 most popular multi-brand toner refill kits are the universal monochrome kits #1, #6 and #7 and are available from 123 Refills at under $30 per refill kit. 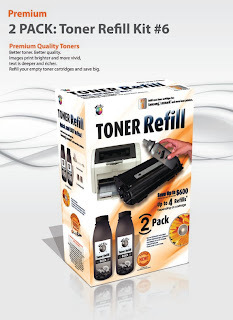 These refill kits yield up to 2 refills depending on the cartridge that is being refilled, with costs as low as $15 per toner cartridge. Uni-Kit Toner Refill Kit #1 covers over 95% of HP monochrome laser toners, and comes with a hole making tool. The 2pack comes with 2x the amount of toner. 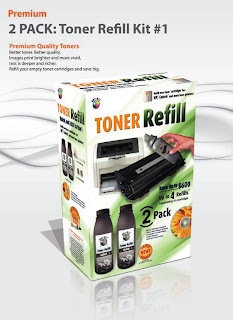 A 6pack of toner refill bottles is also available, as is a 10kg bulk toner bag for volume refillers. Uni-Kit Toner Refill Kit #6 covers over 95% of Samsung / Lexmark monochrome laser toners, and comes with a hole making tool. The 2pack comes with 2x the amount of toner. 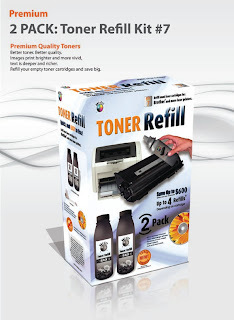 Uni-Kit Toner Refill Kit #7 covers over 95% of Brother monochrome laser toners. Hole-making tool is not required. The 2pack comes with 2x the amount of toner. Uni-Kit inkjet refill kits now have an upgraded compatibility list. According to research firm IDC, the printer market in the Middle East (specifically in the UAE) will show strong growth. Strongest growth is expected for color printers and multifunction / MFC printers. Printer manufacturers are increasing their printer line ups for the year, which includes a series of new printers by Brother Gulf, which is the Brother printer manufacturer's partner in the Middle East. Epson has also announced the release of a new printer targeted specifically for the Middle East ink and toner market. 123 Refills is looking to be a part of the growth in printer and printer consumable usage in the middle east, having already established a presence through its announcement of a master franchisee in KSA. 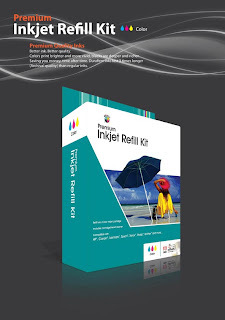 Middle East printer ink and toner refills are expected to continue a fast growth in the coming years and Middle East ink franchises are also on a growth curve. For high-speed color printing, the only solution thus far has been laser printers. This year, however, Memjet has entered the market with an inkjet printer that prints the entire page simultaneously in about 1 second. "We bring revolutionary changes to the market" boasts the Laouer Len, CEO of Memjet, which demonstrated its technology at the Consumer Electronics Show in Las Vegas last week. Unlike conventional ink-jet, Memjet has a large, firm head with 70,000 tiny nozzles that spray ink simultaneously. With the price range around $ 500 to $ 600, the new printer is priced in line with color laser printers with similar performance. Memjet also claims a lower cost of printing around $ 0.05 a page. Professional models of Memjet printers, specially designed for printing labels, are already used by companies such as FedEx. The next model for Memjet is intended for office use. According to Memjet press releases, the development of the head and nozzles was made possible thanks to developments in micro-electro-mechanical systems, better known as MEMS. The technology is already used in iPhone sensors and the controls of the Nintendo Wii. 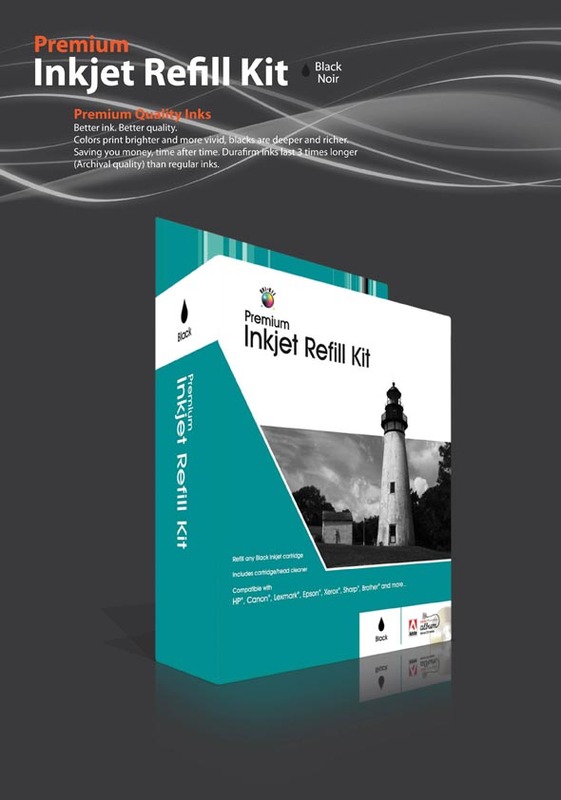 The best selling Uni-Kit Premium Black Inkjet Refill Kit has been upgraded to now include 50% more black ink than before. At a time that most companies are raising prices or shrinking products (see a recent report from consumerreports.org that shows that many product packages are shrinking to hide price hikes, see also an earlier blog about Lexmark raising its inkjet cartridge prices), Uni-Kit has taken the step to offer more instead of less. Why? Its simple - offer customers better value, and they'll appreciate it and it builds customer loyalty and retention. The refill kits now includes 3 x 32ml black ink bottles (previously 2x32ml), which is enough to refill an inkjet cartridge 3-7 times depending on the capacity of the cartridge. 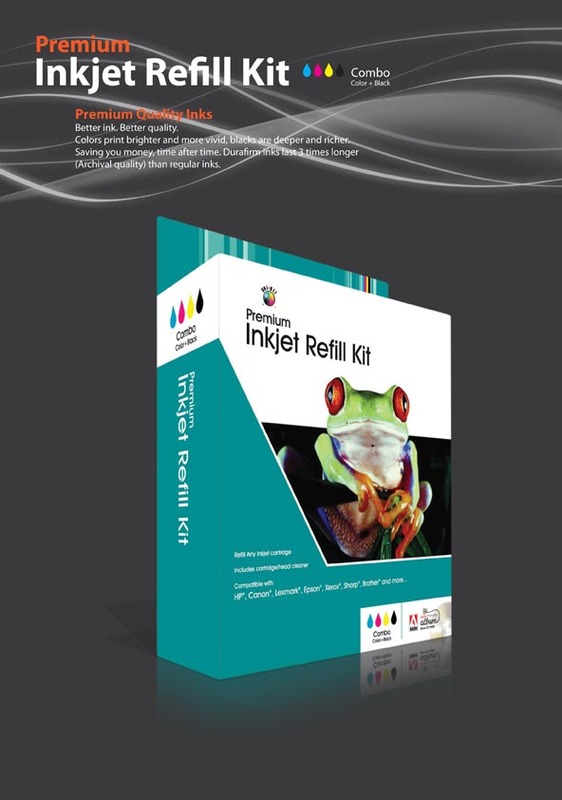 The Uni-Kit Premium refill kits are universal, they will work on all inkjet cartridges. 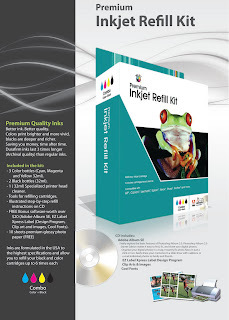 The kits also come with 32ml Universal Cartridge and Print Head Cleaner (a useful accessory to unclog print-heads that may have been clogged due to non-use before refilling), as well as a complete set of tools and refill accessories, a CD containing free software worth $20 and detailed, step-by-step illustrated refill instructions for all inkjet cartridges. In addition, the kit comes with FREE 10 sheets of professional grade Durafirm Technology Photo Paper. The Uni-Kit inks are also Durafirm Technology, which means they last longer, prints are brighter, more smudge resistant and water resistant than other inks. 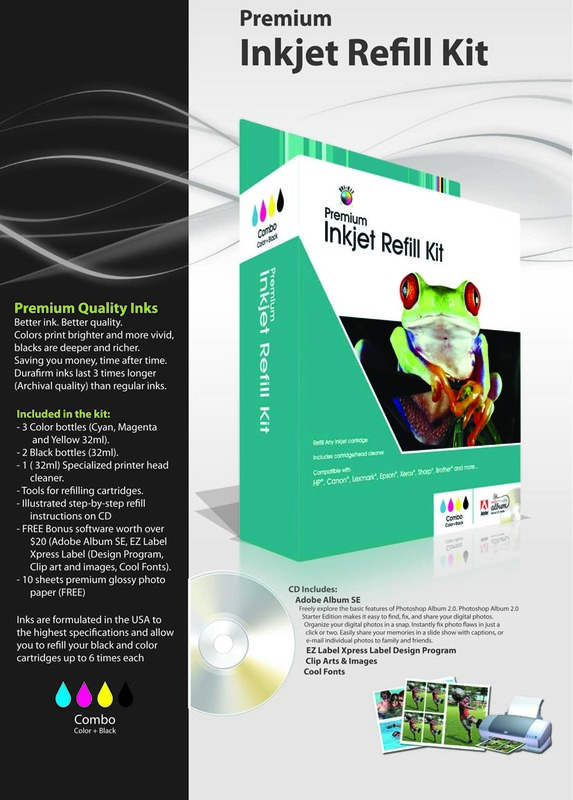 123 Refills has kept the price for these Premium Inkjet Refill Kits the same, for $12.99 you now get 50% extra black ink. 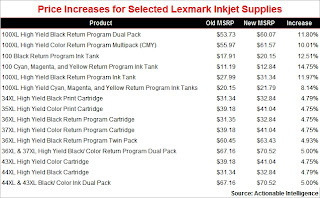 According to Actionable Intelligence, Lexmark has once again raised their prices on many of their popular inkjet cartridges. This is particularly of note, not only because it is not the first time that they have done this (in a short amount of time), but because Lexmark has been aggressively marketing their Vizix line of inks as a low cost alternative (and the cost increases are also on Vizix brand). And what about the timing of the price increase? Right after the busiest shopping time of the year, when many people just bought themselves (or others) a new printer. Lexmark printers are among the world's cheapest, often sold close to cost (possibly below cost at times). You can pick up a new Lexmark printer for under $50 through some store specials. Refurbished models can cost even less than that. 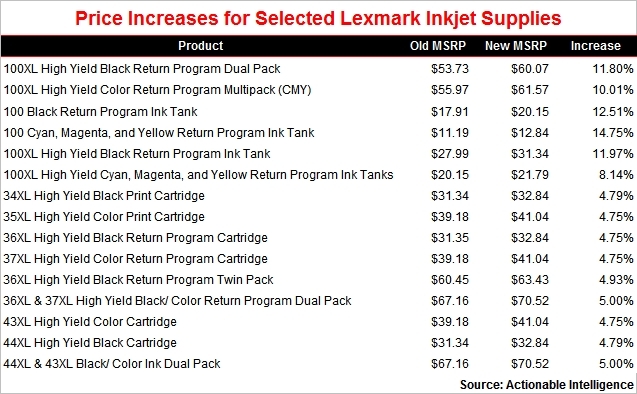 And considering that Lexmark's markup on their inks is probably at least 500%, it does make "news" when Lexmark decides to raise prices on popular cartridges by another 5-15%. The popular Lexmark 100 and 100xl cartridges have gone up in price around 10-15%. The popular Lexmark 34xl, 35xl, 36xl, 37xl, 43xl, and 44xl cartridges have gone up around 5%. 123 Refills is keeping their prices steady, even offering discounts from time to time. Prices are around 50% cheaper on remanufactured Lexmark cartridges than on Lexmark originals.